"A quick and simple soup full of veggies and protein to fill anyone's appetite!" In a large pot over medium high heat, cook ground beef and onions, breaking up larger ground beef pieces, until beef is thoroughly cooked and no longer pink. Drain off fat. 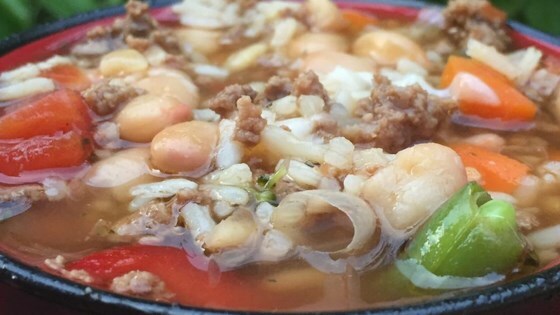 Stir in tomatoes, beans, and broth; bring to a simmer over medium-high heat. When mixture begins to bubble, add vegetables and rice. Allow to come back to a simmer; reduce heat to medium for a gentle simmer. Cook until rice is tender and vegetables are warmed through, about 8 minutes. Garnish with Parmigiano Reggiano cheese if desired.